Click here to read the complete HWU 2018-2019 Budget (in PDF format). 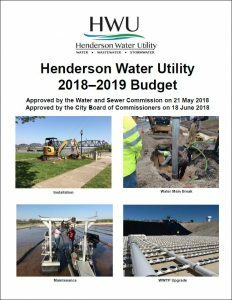 Presented here are the Henderson Water Utility 2018-2019 Operating and Capital Budgets. We will discuss this in appropriate detail and seek your approval at the 21 May 2018 Board Meeting. The Operating Budget includes estimated revenues of $20,630,740, which shows an increase of approximately 7.16% from last year based on the imposition of a fixed charge for water and wastewater services, effective July 1, 2018. Revenues were budgeted projecting static usage from our major contractual customers and factoring the continuing trend of usage decrease from non-contract customers (projected 3% decline in residential and 2% decline in industrial/commercial customers). This budget does not anticipate any additional borrowing for major projects. Capital projects in this budget will be paid from cash generated from operations and existing reserves. Our conservative budgeting and forecasting over the last several years has served us well, however our declining cash position resulted in adjustment to our rates and rate structure thru the implementation of $15 fixed charges for water and wastewater customer being phased in effective July 1st in 2018 and 2019. Additional adjustment to our rate structure will likely be necessary in the future to sufficiently fund operations and capital projects. Operating expenses are budgeted at $18,914,387, a 1.08 % increase when compared to last year. The increase is due primarily to higher projected costs for chemicals, fuel, lab supplies and testing expenses partially offset by management’s expense reduction initiative to reduce payroll and associated costs. Salaries and wages are based upon the 101 full-time budgeted positions identified below. With Commissioners, temporary/seasonal employees and interns, our total budgeted complement is 116. FICA and Medicare are determined by salaries and overtime charged at the applicable statutory rates. Life Insurance, Employee Assistance Program, and Cancer Insurance expenses are based on the number of eligible employees and rates supplied by the City. Medical Benefits expense is based on the number of eligible employees and the rate per employee supplied by the City, at a cost of $17,000 per employee, up from $ 16,000 in the prior fiscal year. Workers Compensation charges are based upon 2017 – 2018 charges to date. Unemployment Insurance expense is based on 2019 projected rates from the City. Retirement Expense is based upon the required contributions of 21.48% of gross wages for non-hazardous duty employees. Last year the required contribution was 19.18 %. Fuel: We have increased our planned expenditures considering recent trends of gasoline prices. While we can’t predict what costs for regular gas will do, our current trend has trended over budget during the past fiscal year. Repairs to Vehicles, Equipment and Structures: These numbers tend to vary annually, since expenditures depend on what breaks and when, along with normal maintenance of equipment and facilities. These items were separated into additional subcategories in the prior budget year, to provide better tracking. Management anticipates reduced costs in this area. Lab Supplies & Testing: These categories show some of the largest budgeted increases due to additional mandatory testing requirements for various processes, along with reclassification of some testing still being included in contractual services in prior year. Chemicals: We have increased the chemical budget based on increasing costs along with current trends in usage which are a result of variation in water and wastewater conditions. Last year’s personnel budget (after amendment during the year) contained 107 full-time classified employees, the General Manager, 5 Water & Sewer Commissioners and 13 seasonal employees, for a total of 125 budgeted positions. We modified that total early in the Fiscal Year when we added an additional maintenance technician position to accommodate a promotional opportunity but did not increase our total headcount. In the new budget, we will reduce our complement of employees to 101 full-time equivalents, including some unfilled positions as detailed below. This equates to 85 full-time employees at full complement. Interns and Seasonal: We are continuing the Seasonal “Treatment/Engineering Intern” positions, since we’ve had pleasant experience with the young people hired into these positions. We’ve reduced the number of seasonal employees slightly. As an example, there are 14 total classified positions listed in the Water Treatment Operator I and II classifications; however, there will never be more than 10 of those positions permanently filled. Four Water Treatment Plant Operator I positions exist, allowing us to hire and train new operators due to turnover or vacancy; but these positions are only filled when new, untrained operators are hired, and as they gain certification and experience, they will test up into the higher classification, never expanding our total working complement of 10 water operators. All of these “ghost” slots taken together overstate our actual full-time complement by sixteen positions, so that the grand total of 105 full-time positions overall will never actually exceed 90 actual employees (excluding our Commissioners), and not including seasonal employees and interns. Maintenance: In the 2017-18 Budget, we had a position for Maintenance Welder, and the incumbent employee retired in August 2017. After going for most of the year without filling this position, we feel comfortable dropping that from our roster. We will initiate training for other employees in our Maintenance division to cover those duties, and anything large or elaborate that we construct will be contracted out. We’ve also eliminated a seasonal “welder helper” slot. Construction Inspector: We’ve had a position of Construction Inspector for several years, but this position has not been filled since early 2017, when the incumbent was reassigned into a Crew Leader position. During one recent project, we used a retired employee to fill the need for inspection, through an arrangement with a local engineering firm. If workload requires a full-time Inspector during the coming year for a particular project, we feel confident that a similar arrangement can be worked out, so we are eliminating the full-time Construction Inspector position this year. Superintendent: We have had two superintendents in the past, one for the normal field crews and one for “construction”. 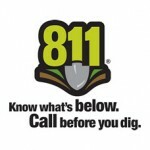 Since we have largely retired the construction operation and merged all the crews under one superintendent, we feel that we can cover the field operations with one superintendent position and reassign some functions in Field Operations to answer directly to the Director. Safety and Training Coordinator: We believe it is possible to rely on the City for more of the Safety/Training functions, and to forego having our own person in this position. This will shift more duties for safety onto mid-level management, and we will likely have to rely more on outside training resources. Engineering Technician: The incumbent left to take a job in a City department, and we will eliminate this position in the new fiscal year. This may lead us to use outside drafting services for internal projects and easement drawings. Project Engineer: Our current Projects and Compliance Manager is retiring at the end of July, so we are taking this opportunity to restructure that position into a Project Engineer, who we hope will be an entry-level person that we can train up to take the place of some of our aging engineering talent. Utility System Crew Leader: With a vacancy in this position, we are restructuring our field operations to include four, 4-man crews, rather than five, 3-man crews. The position will remain on our roster but will be unfilled. Part of our succession planning in this area is to rotate potential leaders into this slot, to assess the possibilities for promotion. Our Capital Budget for this year includes a total allocation of $3,000,000 for capital projects and new equipment. We have not included detailed descriptions of the items listed as they seem to be self-explanatory; details available on request. A number of projects that were budgeted in the 2017-2018 fiscal year are being carried over into next year’s budget as incomplete. Completion of the North Wastewater Plant (Headworks) project in the last quarter of CY 2016 was the last piece necessary to complete our Long-Term Control Plan (LTCP) as amended, as required under a Consent Judgment with the Commonwealth of Kentucky. As we completed that long process, we have now terminated that judgment and are released from those obligations. Our focus continues to shift to Water System projects, including renovations at the North Water Plant, and planning for expansion/renovation at the South Water Plant. We have completed the first three of a series of projects to renovate our nine water storage tanks with the Frontier, College and Vine Street Tank projects. Based upon the limited funds available, our capital spending in the 2018-2019 FY is restricted to $3,000,000. As discussed last year, $1,144,351 of that total is obligated to completion of the South Wastewater Treatment Plant Basins project. Additionally, $221,000 is being allocated to other projects that are planned or ongoing, leaving $ 1,634,649 in unobligated funds for various projects in our Capital Improvement Plan. Choosing to identify capital projects as we go through the year has worked well for us the last three years, where each project is brought to our Board in an Action Report, giving us the opportunity to review and discuss each project in depth. This allows us maximum flexibility to meet critical needs as the year passes and increases Board oversight. It is doubtful that we will replace any vehicles or purchase large equipment as the year progresses, since funding is so tight. The exception is the capital lease we will be entering into for a new Vactor truck, which is a way to spread that large expenditure over time. You have received a copy of our updated Capital Improvement and Strategic Plan separately, which outlines our plans in the short and long terms for capital construction. This plan was first produced in 2014, and we’ll continue to revise this blueprint yearly at about this time, to better tailor our budgeted capital expenditures to the needs identified in the plan, and to provide justification for our capital spending priorities. The operating margin included in this budget remains thin. With the implementation of fixed water and wastewater charges, along with the comprehensive review of expenses, both overall and specifically in conjunction with cost saving initiatives, we have improved the operating outlook projected for the next fiscal year. However, based on our required debt service and capital needs, we are still projecting to diminish cash reserves by approximately $1.2 million during the fiscal year. The phase in of additional fixed charges, in the fiscal year 2020, will provide additional needed revenue, but ongoing prudent examination of operating costs and future capital needs will be required. In conclusion, this is an austere budget. Needed actions have been made to improve the financial position of the Utility but additional measures will be needed to ensure that future operating and capital needs are met. We want to thank our Administrative Staff for their diligence in working on this document. It represents a combined effort of many people. This group has an ongoing commitment to providing safe, clean, dependable, and reasonably priced water services, from intake to outfall.